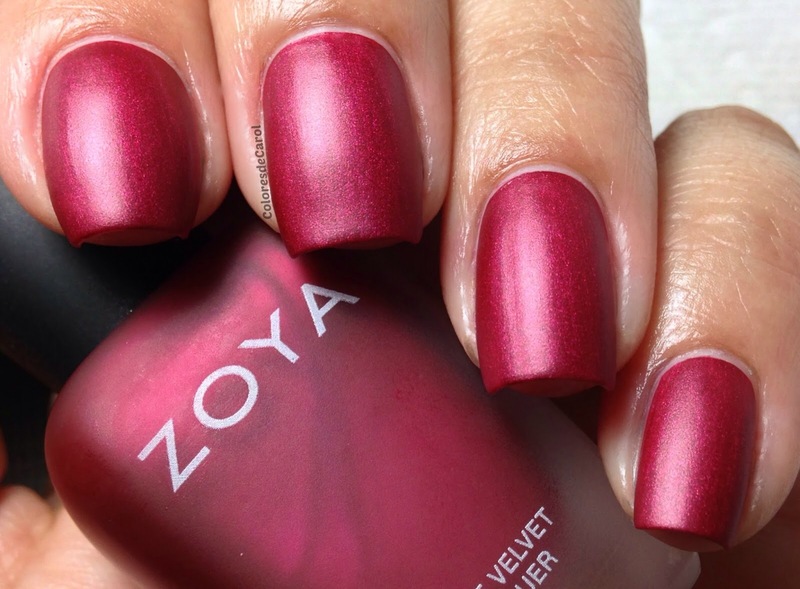 Well, I was browsing the web for nail polishes as you do at 3pm on a Wednesday afternoon, and I came across an advertisement about the rerelease of Zoya’s Matte Velvet polishes, I googled swatches and they look amazing. I was amazed at how much they actually look like velvet, and the colours are beautiful. I’ve never liked every colour in a whole collection before, here are my thoughts on Zoya’s rerelease matte velvet collection. ‘Dovima’ is a stunning matte black which will be perfect for Halloween or even to transition between autumn and winter. A ‘Dovima’ mani would also look amazing with a glossy tip to give it that ultra glamorous look and feel. ‘Posh’ is a very true bright red shade, again it can by made classy or you could add an edge of rockabilly with black vintage patterned decals. I love red and black together and they look stunning on the nail, the velvet texture of the polish coupled with the smooth look of the decal will really make your manicure pop. ”Harlow’ is to me more of a fuchsia or deep pink shade as opposed to a berry red, it’s a lovely shade and very wearable but for me it would need to be just a little bit darker. However i do think this polish would look beautiful at a New Year’s Eve party, ‘Harlow’ is a lovely colour and even though it isn’t a true favourite I’d still have it in my collection. 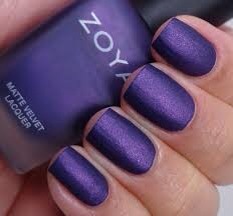 ‘Savita’ is a very eye catching bright purple shade, I like this polish because unlike the rest of the collection it has a brightness to it which takes away from the strictly gothic look, however I do think the matte velvet finish to the polish makes it a fall or a winter only polish, it would just look too heavy to wear in the summer. ‘Veruschka’ is by far my favourite polish of this collection. It is a stunning deep green shade. 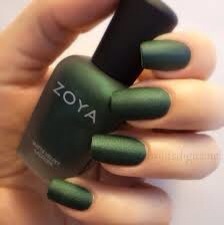 Green for me is a very versatile colour and a favourite of mine when it comes to nail polish. ‘Veruschka’ would look stunning with ‘Posh’ and a gloss tip to create a sophisticated yet eye-catching manicure. And finally ‘Loredana’ which is a gunmetal grey shade, is for me very much like ‘Harlow’ not a true favourite of mine. It seems to be stuck in limbo between black and grey, but it would still make a lovely mani for anyone who’s wants a dark nail but does not want to use a full on gothic black like ‘Dovima’. Overall I really do like this collection the velvet matte finish looks stunning for autumn and winter and there is a beautiful colour selection, there is defiantly something for everyone and it’s a collection I can not wait to own.